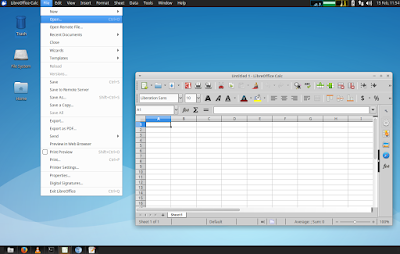 The problem with TopMenu is that it only partially supports GTK3, it doesn't support LibreOffice, and with Ubuntu 16.04, it doesn't support Qt (4 or 5) applications. Here's where Vala Panel AppMenu comes in. Vala Panel AppMenu is a global menu panel applet for Xfce, MATE and Vala panels, which uses unity-gtk-module as its backend, and it works with all the applications supported by Unity's AppMenu. As a result, Vala Panel AppMenu provides global menu support for GTK2, GTK3, Qt4 and Qt5 applications, as well as applications like Firefox, Thunderbird, Google Chrome / Chromium, and LibreOffice. 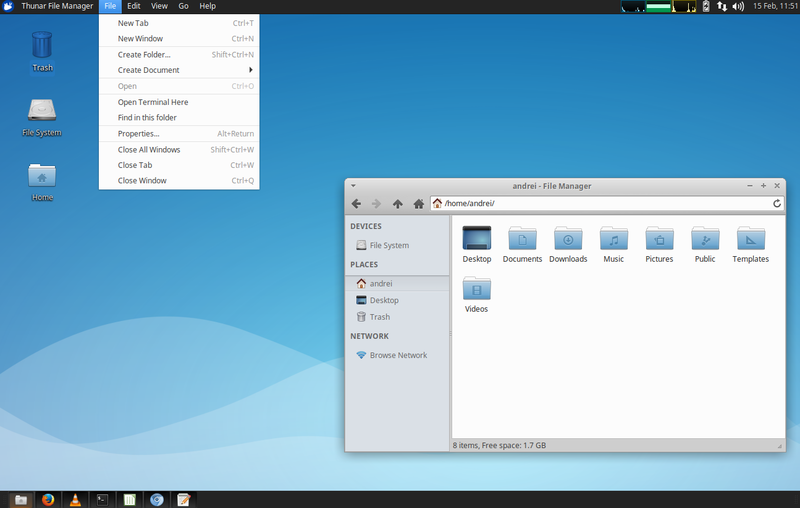 For MATE, Vala Panel AppMenu requires MATE Panel built with GTK3 (so for Ubuntu, it requires Ubuntu MATE 16.10 and newer). Its README also mentions that to build Vala Panel AppMenu, you'll need GTK 3.12 or newer, GLib 2.40 or newer, valac 0.24 or newer and libbamf 0.5.0 or newer. there's no way of changing the global menu font color, and that can be problematic with some themes. For example, the menu font is dark on a dark panel background using the default Xubuntu 16.04 theme (Greybird). This doesn't occur with Numix GTK theme (which is installed by default in Xubuntu) or Greybird in Xubuntu 16.10. You may also want to check out the Vala Panel AppMenu issues page on GitHub. 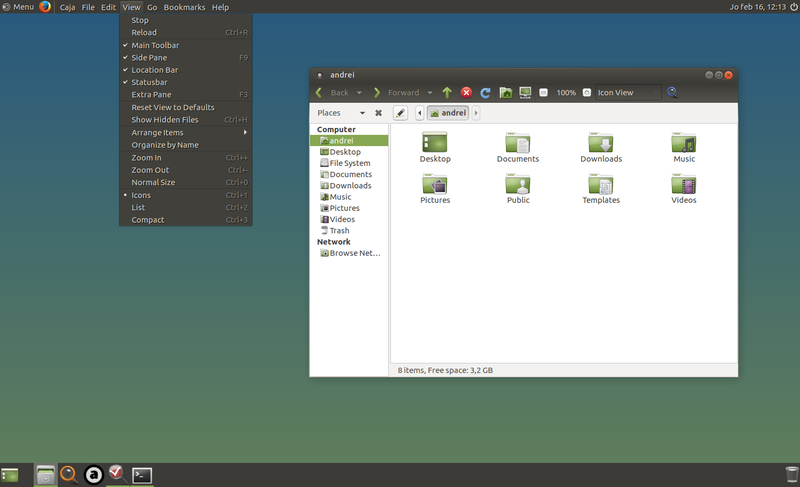 If you don't use Ubuntu or Linux Mint, you can grab the Vala Panel AppMenu source from GitHub. Arch Linux users can install Vala Panel AppMenu via AUR. For Ubuntu or Linux Mint, see the instructions below. 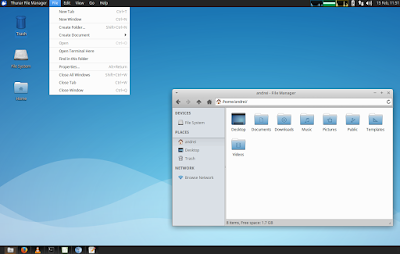 Vala AppMenu is available in the WebUpd8 MATE and Xfce PPA. 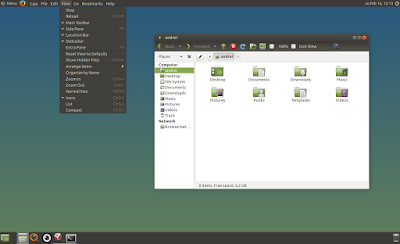 For Ubuntu MATE, the plugin is only available for Ubuntu 16.10, because it requires MATE Panel built with GTK3, and that is only the case for Ubuntu 16.10 and newer. For Xfce, the Vala AppMenu plugin is available for Xubuntu 16.10 and 16.04, as well as Linux Mint Xfce 18.x. 2. Disable the menu from being displayed in application windows (so it's only displayed on the panel; without this, you'll get double menus, in both the panel and application windows). 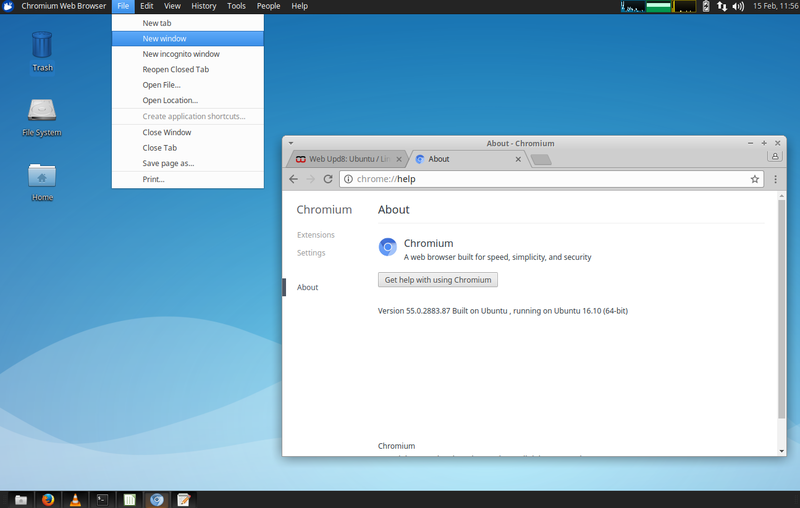 Unfortunately, for MATE, this will not disable the menu from being displayed in app windows for GTK2 (I mentioned this in the issues section above). 3. Restart the session (logout, then log back in). 4. 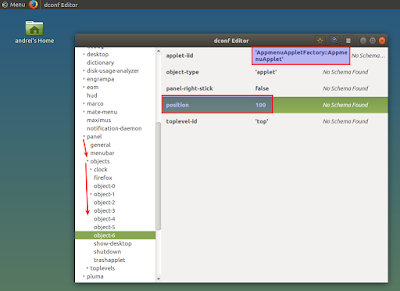 Add the Vala AppMenu applet to the panel (and how to change its position on the MATE panel). 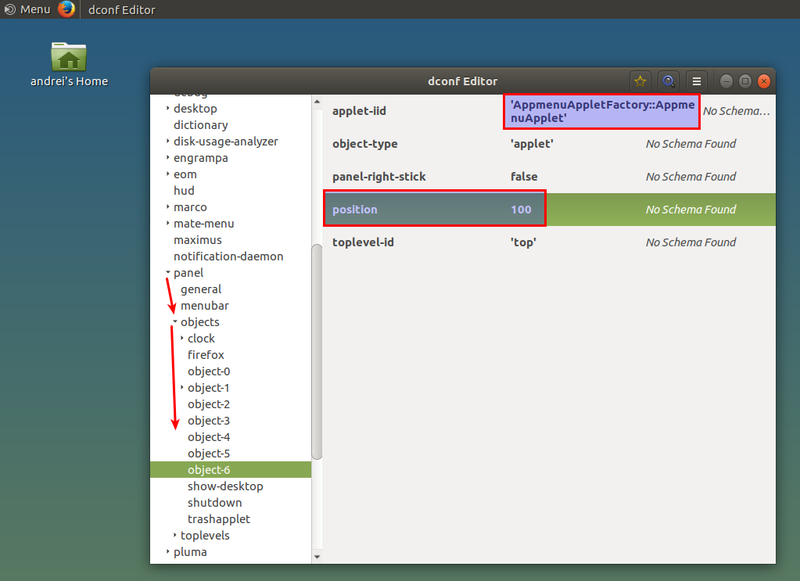 You can move Vala AppMenu to the desired position on the panel via the Items tab from the Xfce4 Panel Preferences. If you have TopMenu installed, make sure you don't mix the two! Unfortunately there's no easy way of moving the applet to the desired position on the panel. That's because the Vala Panel AppMenu responds in the same way to both left and right click, and there's no area to access its context menu. Next, launch Dconf Editor, navigate to org > mate > panel > objects and in the "objects" tree, you should see some items called "object-1", "object-2" and so on. Start from the last object and see which has the "applet-iid" value set to "AppMenuAppletFactory:AppMenuApplet". Note: you may have multiple applets ("object-1", "object-2", etc.) with the "applet-iid" value of "AppMenuApplet..." - in that case you'll need to change the settings for the last one (the higher number). The "position" value represents the number of pixels between the left-hand side of the panel and the applet position. So once you find the right applet, change its position value to suit your needs (try to approximate it, if the other applets are locked, a lower value than the actual position will work in some cases). 5. 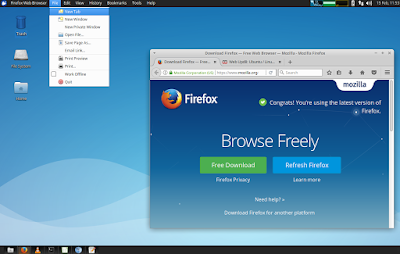 Optional: enable Vala Appmenu (global menu) for Firefox and Thunderbird. By default, Vala AppMenu will only display the Thunderbird and Firefox Unity actions (quicklists) on the panel. To enable the full Firefox and Thunderbird menu on the panel, you must launch Firefox and Thunderbird with "UBUNTU_MENUPROXY=0". Below you'll find the exact steps required to undo the changes made by following the instructions mentioned above. Thanks to WebUupd8 reader omg2090 for the tip and information (check out his comment for how to build this from source and an extra tweak).